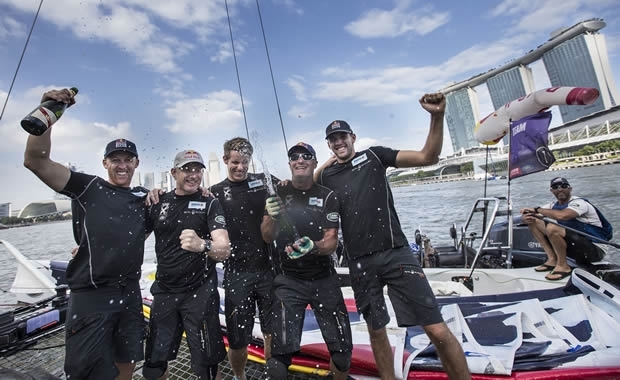 Double Olympic Tornado gold medallists Roman Hagara and Hans Peter Steinacher and their team on Red Bull Sailing Team won the Extreme Sailing Series Singapore, becoming kings of Marina Bay after 32 hard fought races. After three light fickle days, the regatta concluded on a high in 15 knots winds with gusts of up to 21. The team from Austria held a small advantage heading into the final day but held its nerve, despite the onslaught from SAP Extreme Sailing Team who were denied victory by just five points, with The Wave, Muscat rounding out the podium. SAP Extreme Sailing Team was on a mission, nailing confidence boosting early races that made the Austrians earn every point, to take a deserved second place – the Danish team's best ever finish. Gazprom Team Russia, this season with three Russian sailors onboard, including skipper Igor Lisovenko, showed it is a real contender, finishing fourth in Singapore, just seven points behind The Wave, Muscat. The second Omani team, Oman Air, claimed the final race, to finish their debut regatta under skipper Stevie Morrison fifth, with the Australian crew on GAC Pindar, which has been making quiet progress all week, sixth, despite sitting out four races on day two with a damaged bowsprit. Racing on the Extreme Sailing Series resumes in Muscat, Oman over 11-14 March.